Joe and I are both in that stage of mourning where we must find our new normal. At first it seemed like the activity never stopped — receiving friends and neighbors, opening sympathy cards, making arrangements with a funeral home, organizing memorial services, showing up, making connections with our son’s friends, finding old pictures, posting on Facebook and reading replies, admiring the flowers people sent, eating and giving away all the food brought to our home. Then the time came to return to a daily routine, but I wasn’t sure how much I had changed and what I had left. It must be similar for Joe. Both Joe and I expected to stay in our current jobs for another year and a half or so. I wasn’t sure about full retirement after that, and maybe the same could be said for Joe. When you lose a child, though, your perspective changes. It’s natural to want something good (and maybe big) to come from such a tragedy. So here we are, Joe and I, still making our way through a grief process that of course has its ups and downs, reluctant to commit to anything while we’re in such an emotionally vulnerable time. In his For a Dancer, Jackson Browne sings about throwing seeds throughout our lives, and among those seeds may be the reason we were born. Neither Beau nor Thomas has any more seeds to throw. Joe and I are struggling to figure out what seeds we have left. This blog has become a safe outlet for me. I know I can write. I know I have things to say. And I believe my words can help others. Maybe this blog will become my legacy. And the good news is that maintaining a blog is a one-day-at-a-time effort. I can tend to my own emotional needs and to my wife’s and to my other son’s. The blog satisfies my need to reach people. It keeps me connected, helps me along, lets me throw seeds a few at a time. Joe appears to be less lucky. It has been reported that Beau wanted him to run for President. If Joe is like me, he’d love to grant Beau’s wish, win the election, and be in a position to make the world better. But running for President is an all-consuming endeavor — not at all like knocking out a blog post or two a day. Joe can’t be sure that he has the emotional stamina for the race or for being the President the nation needs, let alone for being the husband and father that his family needs. Joe and I have more in common than the recent death of a son. We have both suffered more than our share of sudden, traumatic losses. And we both came through them with our sense of humor intact and with a bullheaded trust and optimism that taken together sometimes lead us to say something stupid, something that doesn’t work the way we intended it to. 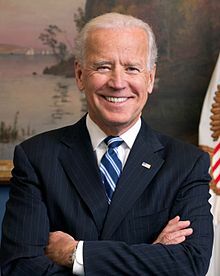 So Joe is one of the very few politicians whom I like, one of the very few who seems genuine, and the only one I can think of at the moment for whom I would campaign vigorously. But first he needs to decide whether he has enough left to be both a good campaigner and a good President. I will respect whatever decision he makes. Well done Mel. Never thought about the parallels between you and Vice President Biden – they are uncanny. Loved that you included the link to the Jackson Brown song – so appropriate. Thank you, Brenda. I didn’t realize how many parallels there were until yesterday morning when I heard about his Colbert interview.